Periodontitis is defined as the inflammatory disease of tooth-supporting structures caused by microorganisms or by group of specific microorganisms resulting in progressive destruction of the periodontal ligament and alveolar bone with pocket formation or recession or both. The main etiology of periodontal disease is dental plaque and there are various other factors that are believed to play a contributory role in the causation and progression of periodontal diseases. According to the American Academy of Periodontology International Workshop for Classification held during the year 1999, the developmental and acquired deformities and conditions were grouped together as an entity that could lead to periodontal destruction. Cervical root resorption and cemental tears. Palatogingival groove or radicular lingual groove (RLG) is a developmental anomaly in which an infolding of the inner enamel epithelium and Hertwig's epithelial root sheath create a groove that passes from the cingulum of maxillary incisors apically onto the root. RLGs can create periodontal and pulpal pathology. Such morphological features compromise patient self-care and favor accumulation of plaque, calculus and food debris. They facilitate growth and later provide anaerobic condition for bacterial selection and proliferation. A 23-year-old female patient reported to the Department of Periodontology and Implantology of UPUMS Saifai, Etawah, with chief complaint of sensitivity and pus discharge from the upper left lateral incisor region. On extraoral examination, there were no palpable lymph nodes, the face was bilaterally symmetrical, and the lips were competent. 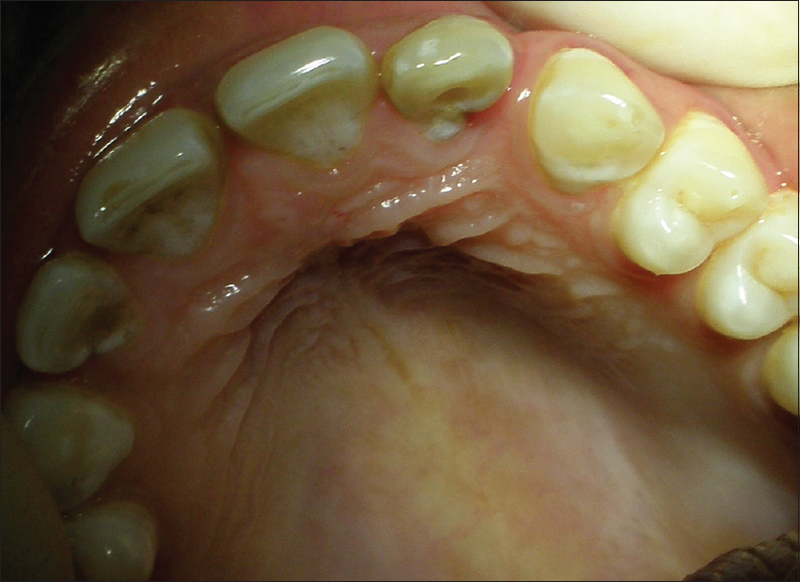 On clinical examination, localized gingival inflammation was present with the accumulation of plaque and calculus. Periodontal examination revealed deep periodontal pocket measuring 10 mm on the distopalatal aspect of left lateral incisor using UNC-15 probe [Figure 1]. The patient had no significant tenderness to percussion or palpation in the maxillary anterior region. There was a presence of a fine groove which started at the cingulum and traveled apically and laterally. On radiographic examination, a tear-shaped radiolucency was present with localized bone loss in left lateral incisor, i.e., 22 [Figure 2]a and [Figure 2]b. The groove was present on the distopalatal aspect of the left lateral incisor. The use of digital orthopantomographs was also done apart from routine intraoral periapical radiographs (IOPAs). There was no mobility observed with the teeth. 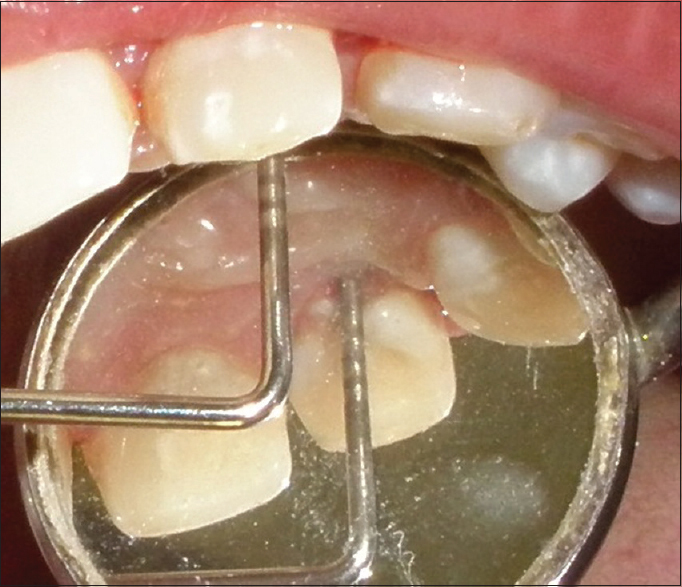 The Phase I periodontal therapy consisted of oral hygiene instructions and scaling and root planing [Figure 3]. After reevaluation of Phase I therapy, a decision to perform periodontal surgery in the upper anterior region was taken. Pulp vitality revealed tooth to be nonvital. There was negative response to thermal and electric pulp vitality tests, while the adjacent teeth responded normally. 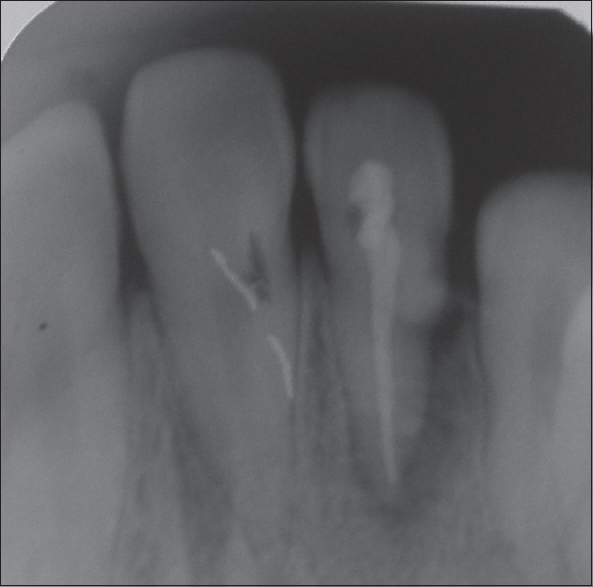 Hence, prior root canal was done and was cleaned and shaped using stainless steel hand files. Access opening was done in respect to 22 [Figure 4]. Biomechanical preparation was done till 35 not using K-file [Figure 5], and curettage of the deep pocket area was done. Canal was debrided with 5.25% sodium hypochlorite and 2% chlorhexidine and filled with calcium hydroxide paste. The access opening was then sealed with Cavit (3M, ESPE). The patient was recalled after 2 weeks. A crevicular incision was given, and a full-thickness mucoperiosteal flap was reflected [Figure 6]. The defect was curetted, and all granulation tissue was debrided. Hence, the groove was clearly visible and was corrected using tapered fissure bur. Canal was dried using paper points, followed by obturation with gutta-percha and sealer. The defect was sealed with glass ionomer cement. Then, the flap was approximated back and sutured with 3–0 silk [Figure 7]. Periodontal pack was placed. Postoperative instructions and medications were given: (1) capsule amoxicillin 500 mg tid, (2) tablet Flagyl 400 mg tid, and (3) tablet Imol Plus bid. The patient was asymptomatic postoperatively and sutures were removed after 7 days. The patient was recalled after 1 month of follow-up. Postoperative IOPA was taken [Figure 8]. The presence of a morphological defect called a palatogingival groove is considered to be an important contributing factor to the development of localized chronic periodontitis, for it favors the accumulation and proliferation of bacterial plaque deep into the periodontium. This anomaly affects maxillary incisors, especially lateral incisors. The first large survey of the incidence of palatoradicular groove (PRG) in the extracted teeth was conducted by Everett and Kramer. Radicular groove can create periodontal and pulpal pathology. They are difficult to identify as an etiological factor. However, in this case, there was a pulpal involvement for which root canal treatment was done in respect to 22. Radicular groove develops with the alteration in the growth of the inner enamel epithelium and Hertwig's epithelial root sheath and involves primarily the maxillary lateral incisors. It has a similarity to dens invaginatus; however, it differs from it in such a way that dens invaginatus occurs due to an unfolding of the epithelium (resulting in groove) rather than an invagination (resulting in a circular opening). Removal of calculus from all the exposed surfaces of the root is very necessary if periodontal health is to be achieved. 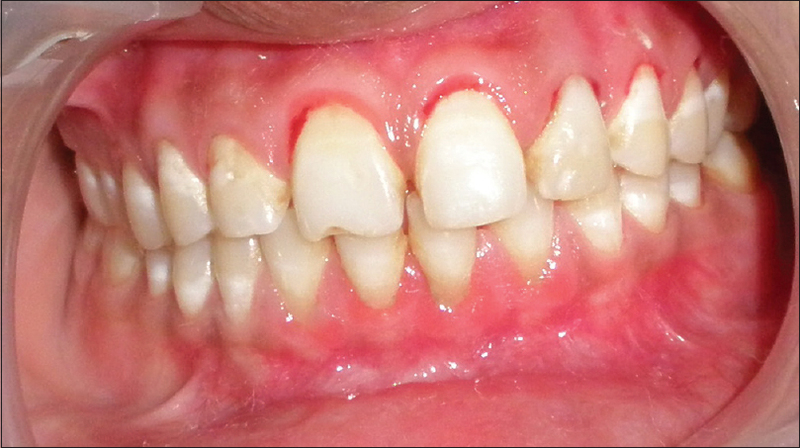 Recognizing palatogingival grooves as the initiator of pathology can often be difficult. The patient may present with pulpal involvement in the teeth that have no caries, history of trauma,, and periradicular abscess also present in this case. Several authors have reported cases in which patients with pathological involvement received delayed or improper treatment since palatogingival grooves were not diagnosed., Conversely, the patient may demonstrate periradicular abscess formation in the teeth with vital pulps. Symptomatic patient may report with concurrent episodes of pain and swelling on the palate adjacent to the groove. Before the final diagnosis, one should look for periodontal abscess, vertical root fracture, juvenile periodontitis, or patent nasopalatine duct. Successful management of PRG depends on meticulous examination, treating the groove based on its extension and depth and treating the resultant pathology. Newmnan GM, Takei HH, Klokkevold RP, Carranza AF. Text Book of Clinical Periodontology. (South Asia Edition) 10th ed.. Elsevier 2006. Gupta KK, Srivastava A, Srivastava S, Gupta J. Palatogingival groove – A silent killer: Treatment of an osseous defect due to it. J Indian Soc Periodontol 2011;15:169-72. 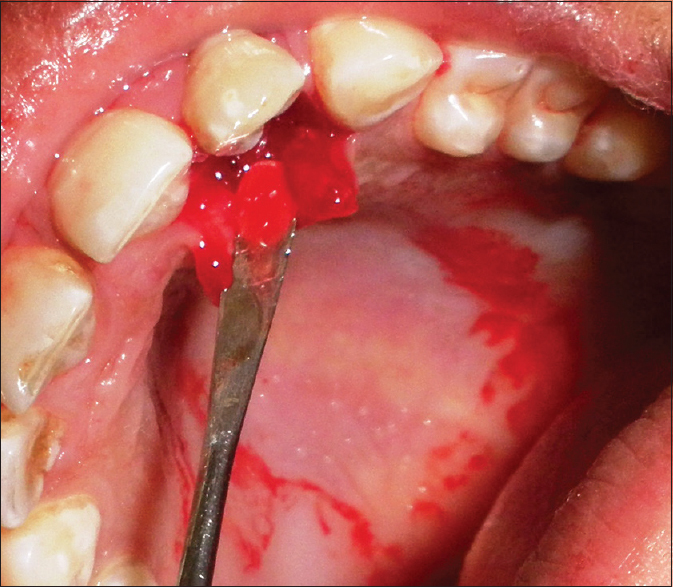 Johns DA, Shivashankar VY, Shobha K, Johns M. An innovative approach in the management of palatogingival groove using Biodentine™ and platelet-rich fibrin membrane. J Conserv Dent 2014;17:75-9. Kozlovsky A, Tal H, Yechezkiely N, Mozes O. Facial radicular groove in a maxillary central incisor. A case report. J Periodontol 1988;59:615-7. 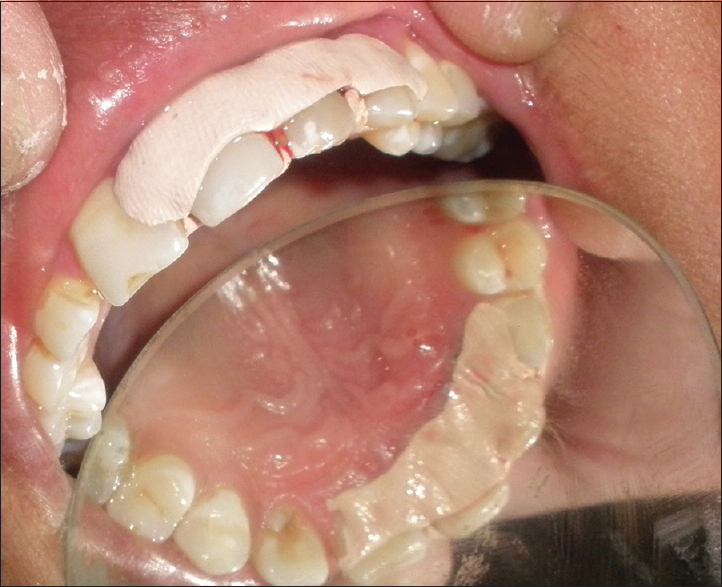 Liji P, Rameshkumar M. Integration of PRF and biodentine in palatogingival groove case. IOSR J Dent Med Sci 2013;6:26-30. Bharti R, Chandra A, Tikku AP, Arya D. Palatogingival groove: A cause for periapical infection. Int J Prosthodont Rest Dent 2012;2:61-5. Attam K, Tiwary R, Talwar S, Lamba AK. Palatogingival groove: Endodontic-periodontal management – Case report. J Endod 2010;36:1717-20. Kishan KV, Hegde V, Ponnappa KC, Girish TN, Ponappa MC. 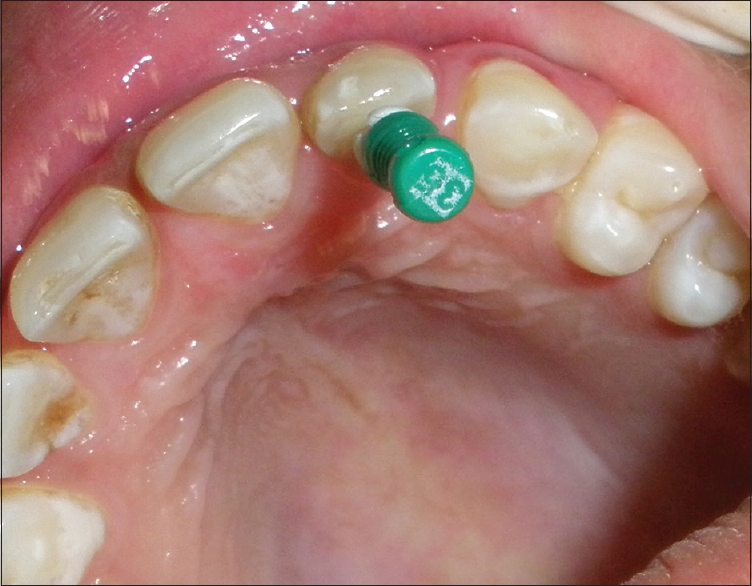 Management of palato radicular groove in a maxillary lateral incisor. J Nat Sci Biol Med 2014;5:178-81.